Lynn Pearson is an independent architectural historian, writer and photographer specialising in industrial buildings, sporting architecture, postwar decorative arts and architectural ceramics. She has been based in Newcastle upon Tyne since 1984 and has published over twenty books including pioneering works on seaside architecture, the architectural history of British breweries, and the architecture of cooperative living. She studied at the universities of Warwick (when it was a few white-tiled buildings adrift in a huge muddy field), Birmingham and Newcastle, and has been a research fellow at the Centre for Urban and Regional Studies, University of Birmingham, and at the School of Art & Design, University of Wolverhampton. Her Tile Gazetteer: A Guide to British Tile and Architectural Ceramic Locations (Richard Dennis, 2005) written for the Tiles and Architectural Ceramics Society, was runner-up and highly commended in the 2005 Nielsen BookData National Reference Book of the Year Awards. Her study of brewery architecture and heritage, Built to Brew (English Heritage, 2014), won the Association for Industrial Archaeology’s 2015 Peter Neaverson Award for Outstanding Scholarship in Industrial Archaeology. 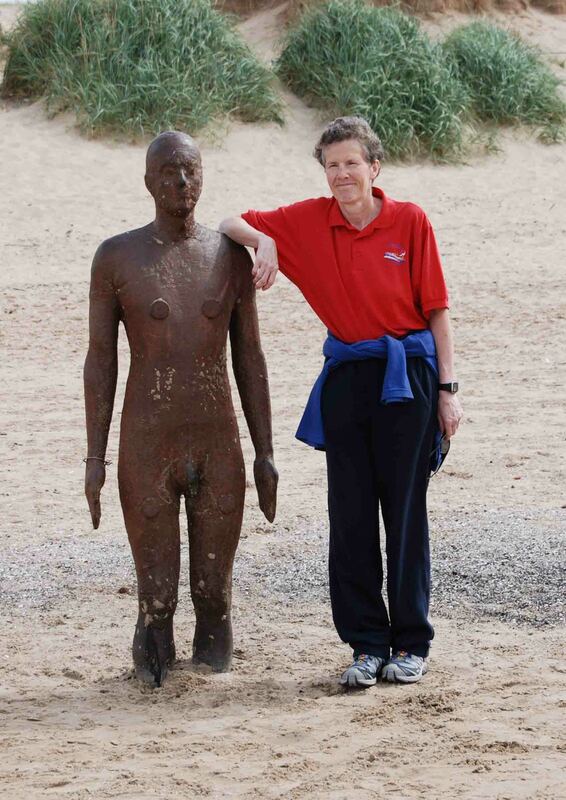 The photo shows Lynn and friend at Crosby beach in August 2007. The iron man is one of 100 figures of Antony Gormley’s Another Place, installed in June 2005. Great website. I love our industrial architecture and the way you record it is delightful. Keep up the good work! I came across your work by finding your book on the history of co-operative living. It has thoroughly enriched my understanding of the history and contemporary challenges of student housing cooperatives. I’m planning on running a non credit course on the history of student cooperative living next term, and we will be reading together several chapters from your book! Roger, thank you, that’s very kind. The co-op is taking up all my time at the moment, a mammoth task! I bet it is. I’d love to pick your brain re listing sometime… and churchyards! I’m interested to find out if you have come across any Jesse Rust glass mosaic floors/wall treatments circa 1870 – 1900 in the Manchester area during your research? This is of particular interest to me as I am exploring the work of Rust & Co. and have found 5 examples so far in Manchester at varying scales.